“Dark chocolate is an important part of a healthy lifestyle.” ~ Aprilanne Hurley, Author, The Party Girl Diet. A Healthier Heart. Thanks to reducing inflammation, and relaxing your arteries, cocoa’s anti-oxidant properties also lower your liver’s output of cholesterol. Studies indicate a daily dose of cocoa can reduce your blood pressure by as much as 3 points and increase blood flow to your heat by 48%. Health Benefit of Chocolate #2. Memory and Energy Boost. A British study reports a dose of cocoa can increase your memory, concentration and energy for up tp 2 1/2 hours after eating it. So go ahead, have a piece of dark chocolate after lunch to help keep you alert and avoid that afternoon slump. A Longer Life. Harvard University research shows consuming cocoa everyday will actually slow the aging process by cutting your risk of chronic illnesses by 36% – which actually translates into the addition of a few years to your life. 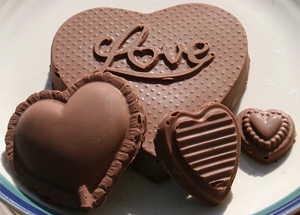 The Party Girl Diet Book Tip: You can enjoy up to 3 ounces of dark chocolate – 65% cocoa or higher a day. Keep in mind, while dark chocolate does offer the health benefits above, it does contain fat and sugar – and you will want to tailor the rest of the foods you consume accordingly. Try making Party Girl Diet Skinny Fast Fudge with dark chocolate chips – just takes 10 minutes to make (plus cooling) and is a lower fat no bake treat. Aprilanne Hurley SFN, CLFC, is a Certified Specialist in Fitness Nutrition, Certified Lifestyle Fitness Coach, and Series Creator for California Living, California’s original lifestyle show featuring CA’s trends in food, travel, and healthy living.